As mentioned in our previous post, the Sizewell camp, near Leiston on the Suffolk coast, starts tonight and runs until Sunday. There are plans for two new nuclear reactors at the site, so the camp is a great way to learn more about this and of showing collective opposition to nuclear power and support for sustainable, green energy alternatives. On Saturday 21st April, 12noon, there will be a protest at the entrance to Sizewell A and B with speakers, plus workshops and much more. Members from SCANS CND hope to join the demo and will report back after the weekend. 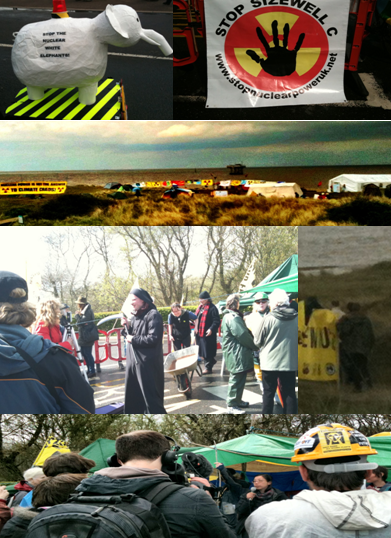 To find out more about the Sizewell Camp, see the Stop Nuclear Power Network (SNPN) website. We are in the middle of the worst economic crisis in decades. At the same time the government is pressing ahead with spending billions of pounds on replacing the UK’s nuclear weapons system Trident – to come into service in 2028 – while inflicting debilitating cuts on public services. Cut Trident and its replacement makes explicit the economic, strategic and legal case against Britain maintaining and replacing its nuclear weapons system. 30 years after the Peace Camp was established on the Portway bridleway, activists will commemorate the camp and the Upper Heyford Peace Blockade at which 752 people were arrested. Please join us from 11:00 am when we will meet at the site of the peace camp on Camp Road (at the junction with Kirtlington Road on the outskirts of Upper Heyford village). 12 noon: Upper Heyford Village Community Centre: lunch and talk about the old peace camp and current CND campaigning. Please bring food to share, photos and memorabilia plus a stone for a peace cairn at the site of the old peace camp. Getting There Sizewell is on the Suffolk Coast, about 8 miles from the A12 and about 100 miles from central London. The nearest train station is Saxmundham, which is 7 miles from Sizewell. Bring your contribution to a hothouse of creativity, a small self-governed society run by democratic camp meetings, a viable example of the kind of world we are trying to bring about. The Peace News Summer Camp helps build a radical movement for the future by building a living community today. MAKING NONVIOLENT REVOLUTION is this year’s theme, with a whole-day workshop co-facilitated by renowned US activist George Lakey (see http://tinyurl.com/lakeytour). Other workshops include: Eyewitness Afghanistan; Diversity of tactics; Chomsky’s politics; Occupy and the limits of consensus; Smash EDO; Inside prison; Cake-making … and much more. PLUS: practical skills sessions, delicious vegan food cooked by Veggies of Nottingham, music, film, fun and participatory entertainment, a bar, campfires, and activities and facilities for kids and families. We will be camping in a family-friendly and renewably-powered way from 26 to 30 July 2012 in the beautiful grounds of Crabapple Community, near Shrewsbury in Shropshire. Join us!